We create beautiful and effective Landing Page. They are summarized all the advantages of your business, or a list of photo services and — most importantly — the contact form, or a form of multi-line phones or online consultant. That's just the last functional and need to «contact» with your potential customer. Landing Page serves to «capture contact» client (its name, e-mail) or to receive an incoming call. We are develop Landing Page using adaptive design — it enables comfortable viewing site on mobile devices. Conversion to Landing Page can reach 30%! And this is because the effectiveness of Landing Page comes from one of the only possible action client. Analysis of the field of activity of your company. Identifying the strengths side of the business. Requirements specification (technical task). According to it, created the site and take the job. Individual design! We don't develop Landing Page based on others designs. 1 version of the design is created by preliminary sketches with the words of the customer. Layout pages: HTML5, CSS3, jQuery and other «beautiful» technology. Adaptive design — always (viewing site on mobile devices). Installing and configuring Google Analitics. .com domain zone + corporate email with a web interface. Want to quickly and low-price Landing Page? Easily. Landing at the assembly on site-builder we create 3 days. Cost — funny: two lunch in the restaurant or $200. Included: 4-5 information sections on the page, with: a list of your services, the benefits of your business, customer reviews, photos, and certainly feedback and address+map. Connecting the domain, corporate mail, statistics, custom SEO-promotion — all of which can be further connected to your site! Landing Page on site-builder — from $200. Time — 3 – 5 days. 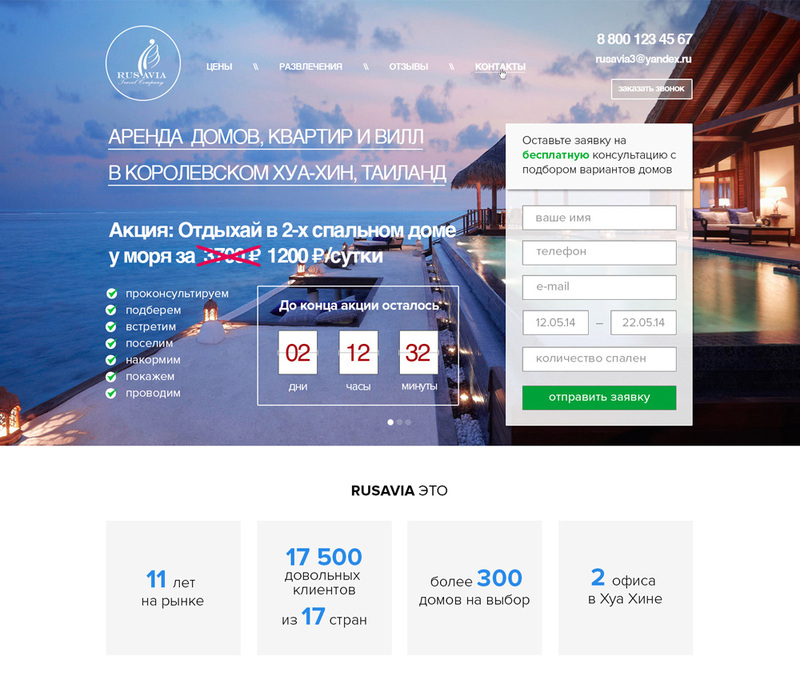 Landing Page — from $600. Time — 1 – 2 weeks. Full demo*version of our Landing Page you can see here or here. Also, examples of Landing Page can be seen here: example #1, example #2, example #3, example #4, example #5, landing page for realty #1, landing page for realty #2, landing page for realty #3, landing page for realty #4, landing page for master-class.